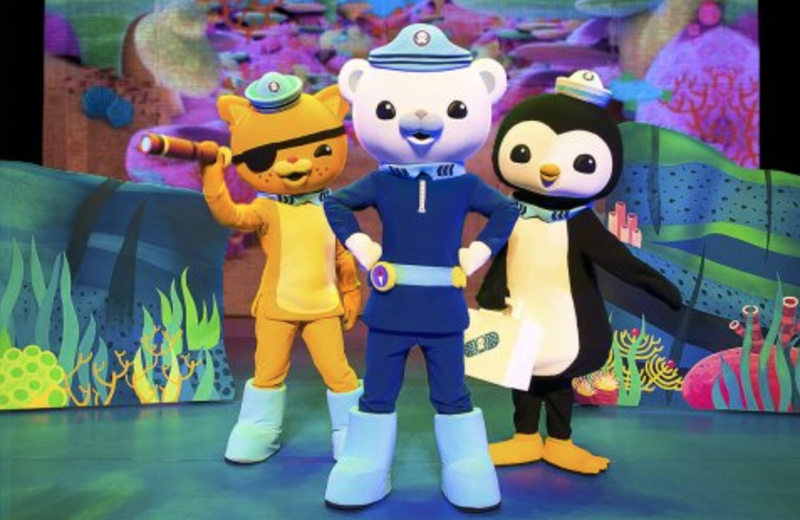 Noah is a big Octonauts fan and it’s actually something that took me by surprise because with Isla being the older sister she really does dominate what channels are watched in our house and I thought we’d lost CBeebies forever! But somehow he managed to reclaim the channel and he is now permitted by her ladyship to watch Peter Rabbit and The Octonauts. He loves it, sings the theme tune and has already asked for an Octonauts birthday cake (birthday in 2 months time). When I told him that we were going to see the live show, he was so excited and actually Isla loves the theatre and the fact that it wasn’t one of her choice didn’t matter. We went to see Octonauts and the Deep Sea Volcano Adventure at the New Wimbledon Theatre, which is fairly close to us, we’ve been there a few times, seeing Dora and Ben and Holly there previously. We took our seats, gave out the obligatory sweets and waited for the show to start and when it did it was clear that Noah was going to love it, having human sized versions of his favourite characters right in front him gave him such a thrill. He knows all the characters which was useful for me because there were some that I hadn’t noticed before in the TV show. In Octonauts and the Deep Sea Volcano Adventure the entire crew of the Octonauts, led by intrepid explorer Captain Barnacles, Lieutenant Kwazii and Medic Peso, embark on an exciting new underwater quest and visit amazing underwater worlds full of adventure, with surprises around every corner. I won't go into anymore detail as I wouldn't want to spoil it but it has a real sense of drama in line with the age group it caters for. Things we loved about it were all the audience participation – from being told to help steer the Octopod to being encouraged to call out to Captain Barnacle, it was great and it really helped to make the kids feel that they were part of the whole adventure. There were also some really lovely songs throughout (from BAFTA-award winning composer Mani Svavarsson no less! ), songs aren’t usually a feature of the TV show but they were great and catchy too. I personally loved the bit when the stage was blacked out the UV underwater creatures came out – this was also something that happened in Peppa Pig's Treasure Hunt and it was really effective in that show too. All in all it had a good plot and was easy for the kids to follow. Both of them loved it, Noah in particular felt like this was a big treat for him and seemed to believe that these were the real Octonauts. The show is around 90 minutes in length and there is a short interval in the middle, which allows for the inevitable kids need for the toilet! If you would like to see Octonauts Live, go to and check out www.octonautslive.co.uk and see if they are near you. We were given tickets free of charge to see the show. All opinions are our own. The show planners have done a fantastic job of ensuring the story incorporates all of the characters, remaining brightly coloured, fun and interactive with lots of singing and dancing. The duration of the show and storyline is also perfect for toddlers in my opinion. McDonald's Football Mum of the Year Awards!